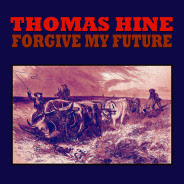 Thanks to singer/songwriter Thomas Hine from Colorado, USA, for the news that his new album Forgive my future was released earlier this month and has been well received by reviewers in Ireland and Britain, with heavy airplay on the BBC and elsewhere in Europe. Quotes from reviews are on the No Depression website. Three tracks from the album - which also features I'm Kingfisher (Thomas Jonsson of Sweden) - can be heard on SoundCloud, and more of Thomas Hine's music is on MySpace and Spotify. He can be contacted by e-mail and Facebook.